As a small business owner, you have a lot going on. There’s a lot you need to focus on, from acquiring new clients, retaining existing ones, to creating new products and services. Focusing on these areas not only requires a devotion of time, but also money, and you may feel you don’t have the budget to grow your business. But you’d be happy to know you don’t have to spend a fortune to grow your business. In fact, there are ways, means, and tools that can assist you to grow your business on a budget. All it requires from your side is some resourcefulness. Here are 15 ways to grow your business on a budget. Whether it be blog content, a free seminar, a free webinar or even a free eBook, offering free high-quality content not only establishes you as an expert, but it builds trust among existing and potential new customers. Trust is crucial in the online space. Build trust before you try and push for a sale. And when you finally offer a paid product, the chances of a sale will be higher because if the free stuff is good, the paid stuff must be out of this world right? Follow influencers like Neil Patel to help you with your content strategy. Using social media is a great way to build your online presence by sharing blog content and keeping potential customers updated on what’s happening in your business and industry. You’re also able to reach a larger target market and interact with your target market. Social media is all about building your presence, establishing conversations, and building trust among your prospects. Use online tools like Buffer and Hootsuite to automate your social media management. Make use of email service providers like MailChimp and ConvertKit to build your eMail List. These email subscribers will be your prospects and potential prospects. Communicate to them via email and offer them immense value. Offer them free guides, content, and specials only available via email. Volunteer to speak at events and connect with other businesses and potential customers. Speaking will help establish you as an expert in the industry, allow you to grow your brand and help you get more clients either through their attendance at events or through referrals. Setup a blog and provide high-quality content that you give your customers for free. They will thank you for it. Authenticity is of vital importance in today’s age. Being authentic works well for the millennial generation, who value it. People enjoy the connection and they enjoy doing business with businesses that remember their names. Greet them by their names, send correspondence in simple, easy to understand language. Don’t use unnecessary jargon and big words. It will only make you look like a pompous prick. Trello: the project management tool allowing remote collaboration. 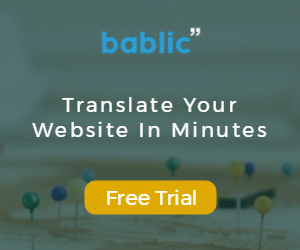 Bablic: do it yourself website translation. Slack: the instant messaging app for teams. Yendo: provides affordable accounting and CRM software for small business. If you recruit top talent you can have peace of mind knowing that these hires know what they’re doing and will look after your customers. Your employees are the lifeblood of your business so recruit wisely. For the customers that remain loyal and continue to make purchases, encourage them to continue this trend by offering specials and discounts for their loyalty. For example, as a coffee shop owner you can give your customers a free coffee with every 10 coffees. Send thank you cards when they buy your product. Send cards when it’s their birthday and/or offer them a voucher they can use for a discount on their next purchase. Also, consider doing away with email and send personalized handwritten thank you cards. This shows you care and that you are willing to go the extra mile. This is a win-win as interns are looking to gain valuable experience and you can make use of them to find new clients for a fraction of what a new hire would cost you. Alternatively, they hire interns to focus on other business areas while you focus on landing new clients. What are you doing right? What are you doing wrong? Where can you improve? Your customers will have valuable insights as they buy your products. They use them. So, listen to them. Consider using SurveyMonkey to create online surveys to gather customer feedback. Involve your most loyal customers in the creation of products. This works particularly well for the millennial generation who values brand experiences. And what better way to let them get involved with your brand, than helping them create a new product. You can make use of online research communities, online surveys and even use A/B testing to see what’s working on your site and what isn’t. You can also apply this to beta-testing new products, by letting your most loyal customers have first access to a new product. As your business grows, so does the need to hire new top talent. Now, you can approach an agency to handle this process and/or place job ads in classifieds, the newspaper and on the internet, but often the best place to look is internally. Consider approaching your staff to see if they know of anyone who would be suitable for the job. Better yet, hire internally. Hiring internally has many benefits, one of which is that the person is already knowledgeable about your company and there won’t be a big learning curve. I don’t recommend spending days and days just monitoring and copying competitors products and services. But it helps to track what they’re doing well and then implementing those strategies in your own company. You can only hope to improve and grow if you’re constantly learning, tweaking, and implementing. For example using SEM rush you can gather insights into your competitor’s strategies in display advertising, organic and paid search, link building, estimated keyword difficulty and much, much more! The above 15 ways are proof that you don’t have to spend a fortune to grow your business. Do you use any of these techniques? How do you grow your business?